It would be easy to situate the vilification of Islam and Muslims in America within a nativist historical arc, one where the most recently arrived minority group is scapegoated for larger economic, social or political problems. This argument has been made by many and certainly bears some truth. At the same time, the demonization of Muslims seems to be facilitating larger legal and political events that have no precedent in American history. Recently, the U.S. government killed its first U.S.-born citizen without trial. The target was Anwar al-Awlaki, a moderate scholar turned radical firebrand whose alleged involvement in terrorist attacks against America earned him a missile strike from a U.S. drone in Yemen. Strangely, his assassination generated considerable enthusiasm for the country’s war effort while leaving unsettling questions about the legality of the strike and its implications for civil liberties largely ignored. In addition to the legal aspects of the execution, the strike also revealed a shift in U.S. policy: Under the current administration, unmanned drone bombings have increased and extended beyond the borders of Pakistan to Yemen, Somalia and Iraq. Drone attacks raise significant legal, moral and human rights issues, but continue without serious debate – perhaps because they are executed as part of an overall defense against the threat of terrorism. On the home front, President Barack Obama recently passed the National Defense Authorization Act, a bill allowing the indefinite detention of American citizens without trial if they are suspected of terrorism. The president said he would not use it. One can only imagine if he, or a new president elect, would remain so judicious. This can all be contrasted with the growing criticism over airport security, highlighted by Senator Rand Paul’s recent dust up with the Transportation Security Administration. The tacit assumption here is all these new rules are supposed to inconvenience the bad guys, not regular Americans. Therein lies the insidiousness of Islamophobia. Americans are sold on a contraction of rights based on fear of an unknown enemy who can be stopped only by relaxing certain rules. That Muslims are marginalized in America is certainly a problem for Muslims, but history may instruct us that it was ultimately a greater problem for America itself. 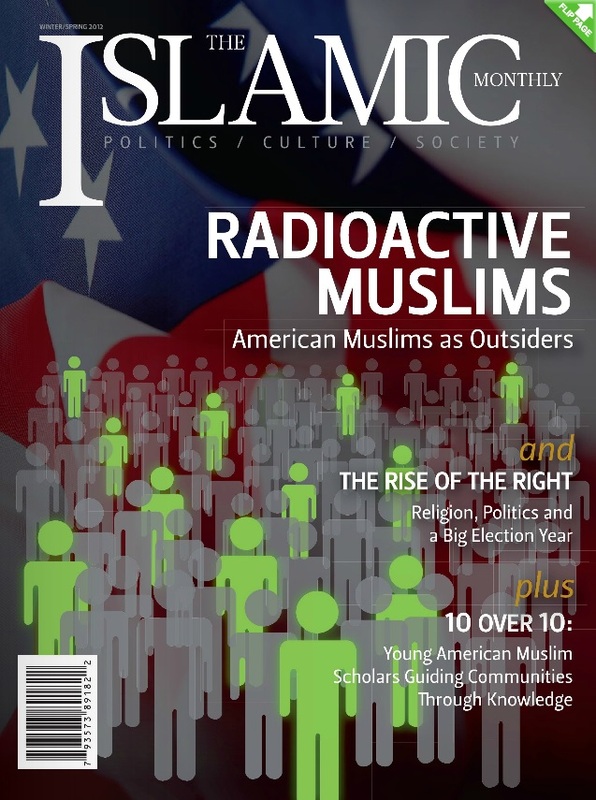 In this issue we explore the phenomenon of the politically “radioactive” Muslim in an election year. The topic is timely and promises to be a critical issue for the elections and whoever sits in the presidential seat in 2013. Engaging the complex positioning of Muslim Americans, Sherman Jackson analyzes the roots of Islam in America in relation to slavery and law, and the interaction of Muslims, non-Muslims and what he terms Euromericans. Not without precedent, Kambiz Ghaneabassiri locates the struggles of Muslim Americans within the larger historical experience of minority communities fighting to secure their place within the American cultural fabric despite significant odds. Asifa Quraishi-Landes highlights the sharia debate taking place now. Gary Laderman considers the role of secularism in American political practice. Rabbi Michael Lerner and Arsalan Iftikhar examine the nexus between religion and democracy in the Jewish and Muslim vote in 2012. In a timely reflection on U.S. history, Frederick Clarkson revisits the often forgotten role of American Founding Father Thomas Jefferson in promoting religious pluralism through the separation of church and state. In search of the most compelling voices in American politics, this issue also features an exclusive interview with Salon.com’s Glenn Greenwald on the intersections of Muslims, U.S. law and the American way. As the Arab Spring pushes into its second year of revolutionary change and crisis, we return to the Middle East with fresh updates on Tunisia and Egypt and offer critical analysis on the meaning and implications of the Spring in the region and beyond.